DMINE Labs is the University of Idaho’s data mining research team, where we are developing data mining transformations + machine learning models that predict the impact of climate change. DMINE.io is our research development server. The University of Idaho’s DMINE lab is a grouping of researchers and students that use data mining and machine learning techniques to explore alterations in our climate. As part of our team work, we provide linux-based applications and analysis development server access, which we are using to create our data mining and machine learning processes. The following is our general methodology, where we acquire and transform data, construct machine learning models, and create climate prediction dashboards. This work is developed as part of the Pacific Northwest Climate Impacts Research Consortium (CIRC), a climate-science-to-climate-action team funded by the National Oceanic and Atmospheric Administration (NOAA). 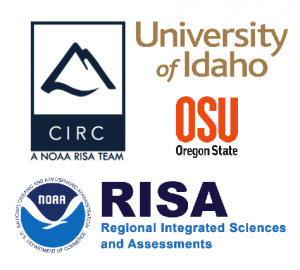 A mix of scientists from disciplines as varied as atmospheric and social science, CIRC is a proud member of NOAA’s Regional Integrated Sciences and Assessments (RISA) program, a national leader in climate science and adaptation. CIRC acts in a supporting role for communities, policy makers, and resource managers in Oregon, Washington, Idaho, and western Montana as they work to adapt to our changing climate. To do this, CIRC collaborates directly with Pacific Northwest communities as part of our Community Adaptation effort. To reach a broader audience, CIRC researchers are developing Climate Tools, a series of free online services and applications that allow users in the climate adaptation community to apply the latest climate science and data as they plan for climate change. CIRC is based at Oregon State University in Corvallis, Oregon. Our researchers can be found across the Pacific Northwest, including at the University of Idaho, the University of Washington, and the University of Oregon. For a more specific description of our methodology – please go to our detailed methodology page.